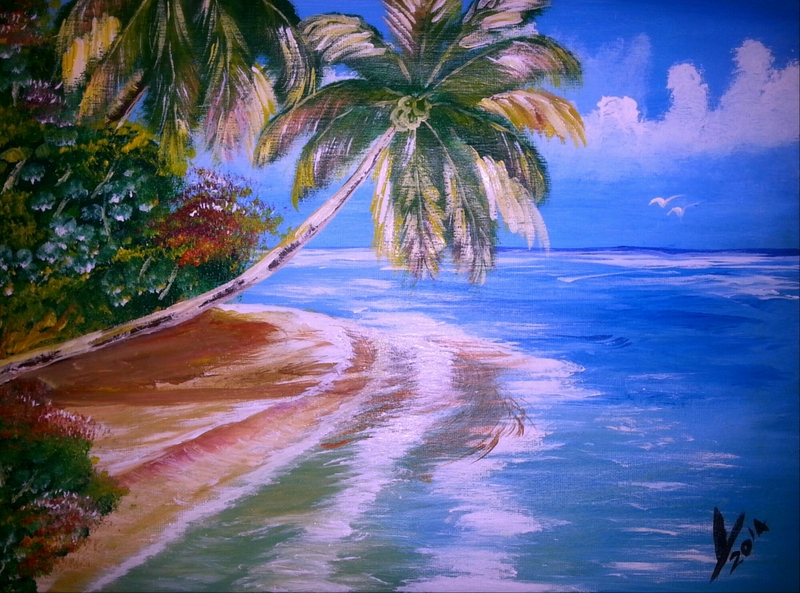 My early work was mainly concentrated on the colours of the Caribbean; mainly Jamaica because that was my surroundings. These colours stimulated my artistic abilities and gave me the opportunity to capture the Caribbean lifestyle on paper and canvas. Art gives me the chance to inspire life, you can escape and find youself. As my art grows and reaches different people, my greatest wish is that I can inspire someone; now my days almost always begin with a blank canvas in front of me, and images of stunning tropical waterfalls, mountains, white sandy beaches and swaying beautiful coconut trees, all fighting for their chances to be the next inline to be released from my mind so they can be painted on canvas. Many thanks, I will be adding a lot more! Thanks for the recent visit to/follow of my blog. It led me here and I’ve spent some time perusing your recent blog entries and some of the work posted on your website. Truly tremendous work! I very much look forward to seeing more in the future. It’s my pleasure, Collin. Honestly, if I had the ability to paint or draw remotely as well as you do, I doubt I ever would have picked up a camera. I’ll definitely be checking back here to see more of your marvelous work. Thank you Collin for following. I’m so pleased you did, else I might not have see your beautiful artwork. Your talent is humbling. Hope you’ll consider entering the art competition at http://www.writing2well.wordpress.com Cheers! Ok thank you. Do I just enter a paing or do I need to do something with it like edit in photo editor with words? As long as the finished entry meets the criteria, that’s up to you. Either, the title “Writing Well” and it’s subheading will remain centered with the artwork replacing the current barn photo, or you can modify your work with the title and subheading integrated within your art. Good question, and best of luck! Thanks for the follow, Collin. I love your style – there is some great work here. Hope you enjoy my site as much. Thank you. I do enjoy yours as much. Thank for connecting through WordPress, Collin. I scrolled through your home page and saw some of your incredible artwork. I also followed on Twitter and Google+. I’m on a few other sites, so feel free to hook up on any of the ones that we’re both on. Hopefully, our networking will help to introduce our work to others as we continue on our respective paths. May you be blessed with an endless stream of creativity. Many thanks for that mate, I will will certainly return the follows and keep promoting. Have a wonderful day. Your work is absolutely fantastic, I got to say I enjoy paintings like these. I never was good at painting, as I am with drawing. I’m too messy and get paint everywhere lol. Keep up this brilliant work, also thank you for the follow. Many thanks prior, its a great pleasure to connect with you! Congratulations on this new blog. I’m glad to have seen it. Keep painting! Many thanks Maggie, I will definitely do that, I can’t and will never stop painting! Thank you for following and look forward to exploring your work also. Many thanks mate, its a pleasure! Thanks for following my blog, Colin, an absolute pleasure to follow your blog, love your dreams, your life and your art. Take care! Please, what does an Architectural technologist do? I never saw that option on career day, lol! Lol. They do the technil aspects of architecture. The architect designs the building, I drew it basically. What a cool career! Not that what you do now isn’t cooler, but still! Lol. It is cool. It was the long hours and stressful times. But it is an ok career. Thanks for visiting Freud Fission Chips’ blog Colin. I hope you enjoyed your time there and that the pics made you smile. I’ve just been exploring your blog and I have to say your images are stupendous. Self taught!! What a talent! I’ve sent your URL to friends of mine who appreciate good artwork and I will be popping back to visit soon. Thanks very much for your kind words and for sharing my work, I truly appreciate that! Thank you for following my blog, Colin. I’ve just been looking through your latest posts, and like the Caribbean images very much. I imagine your surroundings in England are as grey as my own right now, so you must be taking great pleasure in finding colour to compensate, just as I am! Thank you for appreciating my work. Definitely; its very dark and grey here in Birmingham, I am enjoying taking the mind out on a wonderful holiday! Thanks for the like on my blog. Wonderful paintings, i really enjoy how bold they are and the way you used color, It is one of your attributes of your style. Many thanks Rigguz. Truly appreciated! Hi Mr. Clarke! I really enjoy your blog and artwork and so I have nominated you for a very inspiring blogger award! Wow I am very flattered Little Monster. I don’t know what to say. Thank you very much. God bless you! Thank-you for liking my painting on my blog. I think your work is wonderful too! Many thanks Andrew, keep up with the good work! Beautiful Collin. You will go far. Many thanks my friend, looking forward to showcasing my wonderful artwork to you! Oh ok. Where in portland exactly are they from in portland? Many thanks for that. Tips for starting I would say; paint what you feel and like; regardless of who likes it. Just be yourself. Thanks for liking my post and following my blog. I’ve been looking through some of your work and find it beautiful. Best of luck to you! You’re welcome and thanks very much. Thank you for liking and following my blog. Just wanted to let you know there are some sculptural pieces that go along with the story on social media. I’ve been looking through your work and find it beautiful. God bless and best of luck to you! Thank you Collin for liking and following my blog. I like your art, so colorful ! Thanks very much. It definitely as enriched my life I so many ways, and you’re welcome. Beautiful, Collin! I’m so glad our paths have crossed today. Oh thanks Ann; am glad it did! True, The art is a chance order to live beautifully. Imparted by its own means, defines us. The creator is always the generous. Thanks for the “gifts” posted on the blog. What a wonderful surprise. I just wanted to thank you for following my blog and I find out that you are from the islands, Jamaica as well. I was born here but my whole lineage is Jamaican. As a fellow Caribbean artist, I would like to share with you an upcoming art project that I am working on that God led me to do. How may I contact you? Thank you very much and I hope to hear from you soon because as of now I’m following your blog. Your artwork is beautiful. Hi, wonderful stuff. Loving your work as well. Where are you based? You can email me. collinclarke42@gmail.com. thank you very for liking my work. I wish you all the best! Hi Collin, what a great job with your paintings! Also want to thank you for following my web, I hope you enjoyed it as much as I did yours! Thanks for liking my work and you’re welcome, I think your work is wonderful as well, keep up the good work!